Until now, the record low for Arctic sea ice cover was set in September 2007 (when I was in the Arctic on the Noorderlicht) Now that record has been broken and sea ice cover in the Arctic Ocean has reached a new record low. 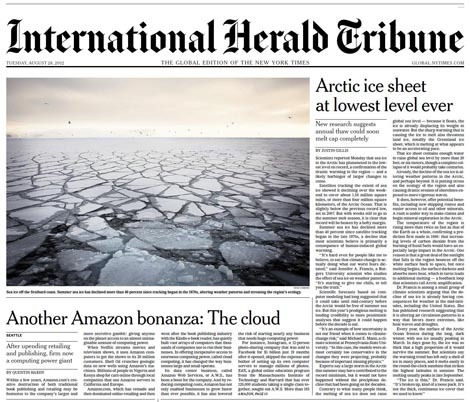 The newspaper front page here features one of my sea ice pictures. Sure it’s great to have a front page picture, but with that comes bad news for the Arctic environment and the weather systems of our planet. One of the best explanations of what this means is here. My gallery about scientists working on the ice is here. My sea ice work used in print.